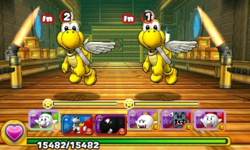 World 7- Airship is the sixteenth and final course of World 7 in Puzzle & Dragons: Super Mario Bros. Edition. It is an airship level with enemies consisting of Bob-ombs, Heavy Para-Beetles, Flame Chomps, Koopa Paratroopas and a second boss fight with Ludwig von Koopa. Clearing this course once unlocks Bee Mario and Bee Luigi as Leaders. This level starts with three battles, then a ? Block, four more battles (the fourth wave having three Bob-ombs), and Ludwig Koopa for the boss fight (if the player already has Ludwig as an ally by clearing ★World 7- Airship, they fight "Bob-omb & Lakitu" instead). The player has all Orb types on the Orb field. ★World 7- Airship is a difficult version of World 7- Airship from ★World 7. The third battle has less enemies. The Orb configuration for this Special World course matches that of its normal world counterpart. Clearing this course unlocks Ludwig as an ally. 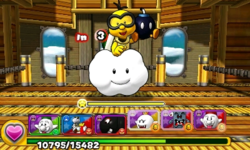 "Bob-omb & Lakitu", replacing Ludwig as the boss of World 7- Airship. This page was last edited on November 24, 2017, at 23:02.